Complete A First Aid Course At Real Response! Enquire Today! Responding to an unconscious person – ensure site safety and assess the casualty to identify injuries, conditions or illnesses Airway management – clear blocked airways and keep them open using specialised equipment Provide artificial respiration – restore breathing using manual, mechanical and mouth-to-mouth procedures Provide CPR to an adult, child or infant – apply CPR (cardiopulmonary resuscitation) using chest compressions for restoring blood circulation and breathing to people of all sizes Two-Person operated CPR – develop teamwork and communication skills to effectively perform CPR Understand Automated External Defibrillation (AED) – diagnose life-threatening cardiac symptoms and treat them by defibrillation using electrical therapy Communicate in an emergency – provide clear instructions to ensure correct procedures are followed and emergency services personnel are notified and informed Respiratory emergencies – understand the signs and symptoms in a range of respiratory emergency situations, along with the procedures used to assist breathing Cardiac emergencies – respond quickly to life-threatening cardiovascular emergencies by understanding a variety of symptoms, including chest pain and hypertension Shock and anaphylaxis – use specialised equipment to restore and revive patients suffering shock or anaphylaxis (severe allergic reaction) Management of bleeding – use effective methods to control bleeding and dress wounds in emergency situations Bandages – learn how first aid equipment and methods are used to bandage wounds, sprains, strains and other injuries. Chest, abdominal and pelvic injuries – understand the signs and symptoms of injury such as localised pain, bruising and difficulty breathing Head and spinal injuries – assist in situations where suspected head or spinal injury has resulted in numbness, headache, stiffness, inability to move and other symptoms Eye, ear and nose injuries – use first aid applications and medicines to dress sensitive eye injuries and ear inuries and treat nosebleeds Strokes, diabetes and seizures – diagnose and respond to a wide range of critical, life-threatening situations Environmental injuries – understand occupational hazards, health and safety issues and emergency treatments for people suffering the effects of environmental exposure or injury. Provide First Aid (HLTAID003) content includes essential first aid knowledge that can be applied in any emergency. At Real Response, the academic attainments are strengthened by simulations that engage students in life-like emergency situations. Real Response instructors encourage group participation for deeper learning that is easily retained and recalled whenever a real emergency arises. Real Response is the flexible approach to learning first aid and CPR. The course can be adapted for industry-specific learning using props and simulations to replicate any setting, helping course participants to assimilate knowledge, develop confidence and take leadership in an emergency. 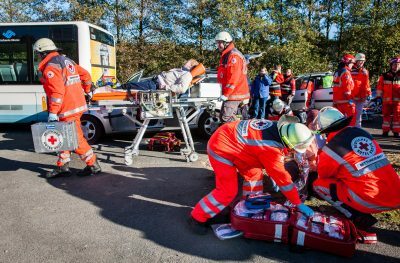 Provide First Aid is thorough and the attainments are long-lasting, resulting in pro-active solutions using life-saving techniques.